Good news for all traditional footballers who appreciate high quality leather with a modern touch. adidas has presented the Copa 18.1 in the brand new Cold Blooded colourway - check it out! As most of you might already know, the adidas Copa 18.1 is a modern classic, with a legacy. It combines classic craftsmanship with modern innovation and high performance. The Copa is for the skilled players, that makes the impossible look easy. For the players that refuses to accept defeat. Any touch leaves the opponent in the dust - any pass breaks the defence. Made for player with guts and grace, these cleats have premium leather in the forefoot for an elite first touch. The Copa 18.1 made its debut in the Skystalker Pack, and now adidas has given us a new colourway of the boot as a part of the upcoming Cold Blooded Pack. The Copa 18.1 Cold Blooded is predominantly black with white brandings and fade into red in the rear. 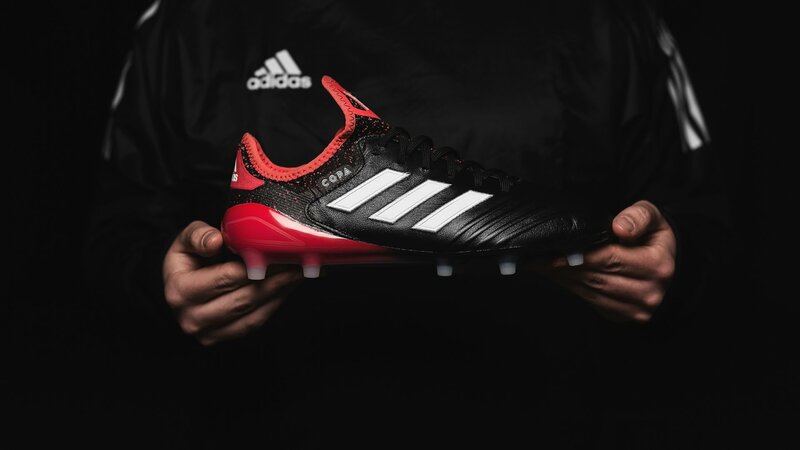 Tech-wise, the adidas Copa 18.1 Cold Blooded boots are identical to the former version in the Skystalker Pack, both in shape and also in the materials that are used. This means that besides the high quality soft and flexible kangaroo leather, you still also get the Primeknit rear and tounge. And that colourway is just beautiful. A truly classic adidas design. Can't wait to see what the 3 Stripes have in store for us when the rest of the Cold Blooded cleats launch! Get your pair of the adidas Copa 18.1 Cold Blooded football boots right here.